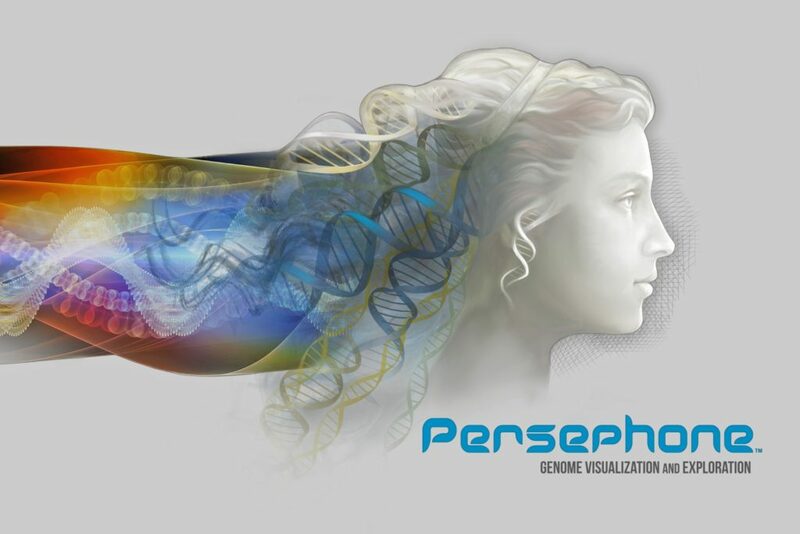 Persephone™ was originally designed as a genome viewer for gene predictors. It allows users to align various types of evidence with gene models and assess the quality of gene prediction. Later, the tool evolved to visualize genetic maps, QTLs, SNPs, synteny, etc. 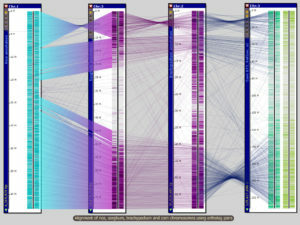 and to facilitate fast navigation in the ever-expanding world of genomic information. Today, Persephone is a state-of-the-art industrial scale genome browser, capable of rapidly showing large data sets due to unique compression algorithms, optimized data transfer, and a fast rendering engine that engages cutting-edge technologies borrowed from gaming industry. The whole Persephone framework consists of a database, an API server that handles communications, a BLAST server, a loader utility to populate the database, and the main client application. Users can also quickly visualize their data without loading to the database, just by dragging and dropping local files or reading them from remote locations via URL. Persephone is used in large corporations on a daily basis and continues to uphold its reputation for stability, power, and versatility. Persephone intends to be the leading system for storing, organizing, accessing and visualizing the world’s genetic information, enabling raw data to be turned into actionable knowledge. Low-cost DNA sequencing technologies have caused an explosion in the amount of DNA sequence information being generated, with terabytes of new sequencing data being generated every day. The information infrastructure and visualization needed to manage, store and use this growing volume of data is more essential than ever. Persephone is re-defining the concept of a genome browser and how data can be stored, accessed, viewed and utilized. Designed for very large data-sets – Persephone has been designed to optimize storage, access and visualization of genetic information for crops. Plants contain great complexity in their genetic information (for example, the genome of wheat is five times larger than human’s, and many agricultural crops contain multiple genomes). Healthcare has lagged behind agriculture in the use of genetic information due to difficulties accessing large population sizes, which is commonplace in crops. With the amount of human genetic data exploding, as genomics moves into the clinic, Persephone is the scalable solution that can handle terabytes of data required to be easily accessed. Optimized data compression and memory usage – Knowing the characteristic of genetic data enables Persephone to provide compression rates that are better than standard .zip compression. This same compression capability allows Persephone to optimize memory usage across the system. These key features will be required in a world where millions of genomes are sequenced annually. Capacity to scan whole genomes – Currently, many genetic tests consist of a panel of one or a few genes. Whole genome sequencing is demonstrating that while there are a few mutations that are common to particular diseases, there are many mutations that are unique to individuals. Just as radiologists are necessary to interpret the subtle differences and indicators in X-ray or MRI data, it is likely that clinical geneticists will need tools to interpret whole genomes and their individual differences, not just panels of a few genes. As new genetic discoveries are made, Persephone enables the rapid identification of afflicted individuals without having to rescan whole genomes. Intuitive user interface – Persephone’s easy to use, intuitive interface allows non-expert users to utilize familiar point-and-click, drag-and-drop, cut-and-paste and zoom functions to explore and compare genetic information. To enable better interpretation, Persephone organizes genetic information for easy visualization, search, filtering, and comparison. If you would like to try the desktop version, please follow this link. A quick-start guide is available here.